Need Rancho Santa Margarita bee removal? The Bee Man is very concerned about people’s safety. Bee swarms can be very intimidating and strike fear in people’s hearts. However, knowing more about bee swarms can help. Scout bees are essentially “real estate agents” for a swarm of bees. When a new queen is born in a colony, the old queen is kicked out. She takes half of the colony with her and sets off to find a new location for a beehive. A swarm of bees forms and rests in one area while the scout bees go off looking for a new location to build the hive. There are many places scout bees look for. Click here for a graphic. The search for a new location can take up to 3 days. During that time, the swarm stays in one place protecting the old queen. Once a scout bee finds a new place for the hive, they return to the swarm to inform the others. Sometimes, scout bees do not find an ideal location or fail to return to the swarm. Consequently, the swarm will begin to build a hive where they are resting. This is very rare as exposed hives are vulnerable to predators and the temperature cannot be regulated as needed for a beehive. Scout bees tend to be nearing the end of their life cycle. As a result, sometimes scout bees simply do not return from their search and die while searching. Furthermore, scout bees can get lost in homes. Their favorite entry points are fireplaces, vents, and canned lighting fixtures. 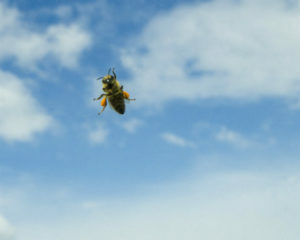 If a scout bee does enter a home, they fly to a window or light source to escape. They continue to fly against the window until they perish. Scout bees stuck inside a home are not aggressive and simply want to get out. The Bee Man offers professional Rancho Santa Margarita bee removal services. Although less dangerous than bees protecting a hive, scout bees can get stuck in a home and cause stress. If you can facilitate an escape route for the bee to use, great. If not, the bee will soon die from exhaustion from constantly flying against the window looking to escape. Scout bees can lead a swarm of bees back to your location, so please use caution and refer to our safety tips here. Finally, if you need any Rancho Santa Margarita bee removal, please contact The Bee Man at (949) 455-0123 before any property damage occurs.